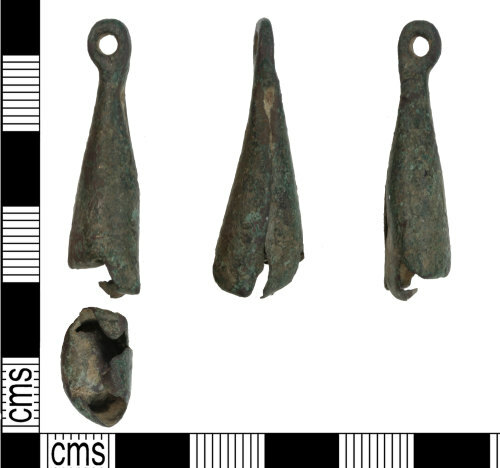 A Medieval incomplete copper alloy teardrop crotal bell dating from the 13th to 14th Century. The bell is made from a single sheet of copper alloy that has been rolled to form a conical shape with an integral flat circular knop, incorporating the suspension loop, at its apex. The bottom is damaged but would have been formed of four lobed-shaped terminals folded in on each other at the base to make a sounding hole. Crotal bells are recognised as horse harness decorations. Similar examples have been recorded as LEIC-94A8ED, SF-CF7E41, HAMP-432557, and BERK-C845BD. Height: 36.5mm, width: 14.02mm, thickness: 0.44mm, weight: 4.52g.